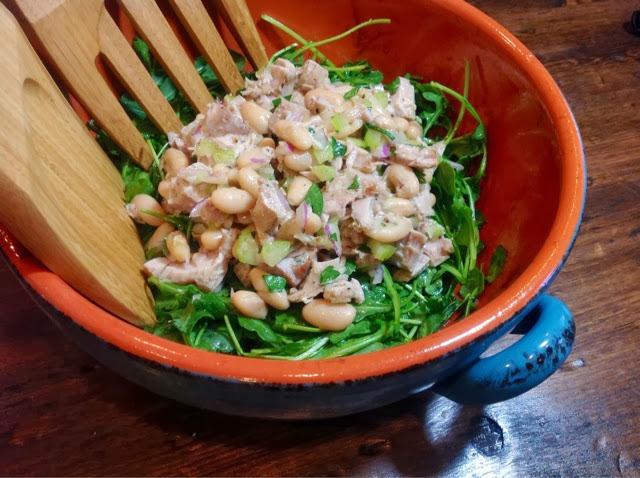 I first had this very simple tuna and white bean salad at Chef Carla Pellegrino’s Neapolitan restaurant, Bratalian. It was so delicious that I had to ask the manager what was in it. I was shocked to learn that the simplest ingredients: lemon, olive oil, salt and pepper, were what made it so good! After having it at the restaurant, I set out to recreate the dish and now it’s a weekday staple dinner for us. The base of the salad is peppery arugula dressed with a drizzle of olive oil, fresh lemon juice, salt and freshly ground black pepper. 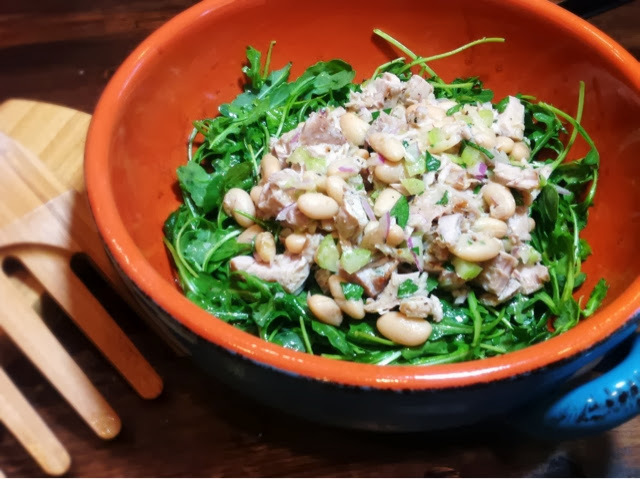 The main part of the salad is juicy grilled tuna paired with creamy cannellini beans, crisp red onion and celery. This salad is crazy-good and amazingly simple to make. 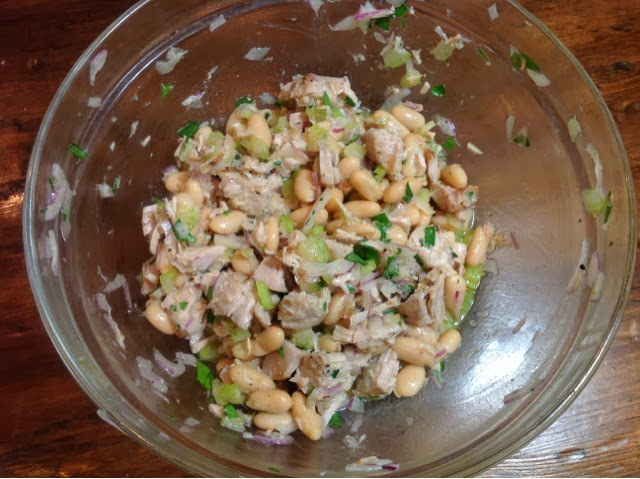 I usually use canned whole white albacore tuna for this dish, but today I used fresh tuna, because I had a thought that it would be even more amazing–and it did not disappoint. I think from now on I will use fresh tuna whenever possible. It is not necessary to use expensive sushi-grade tuna for this dish because the tuna is thoroughly grilled. I found this tuna for a reasonable price at Trader Joe’s. 1. Season both sides of the tuna with salt, pepper and a pinch (about 1/4 teaspoon) of ground fennel. I had whole fennel, so I ground it with a mortar and pestle–alternatively, you could use a spice grinder. 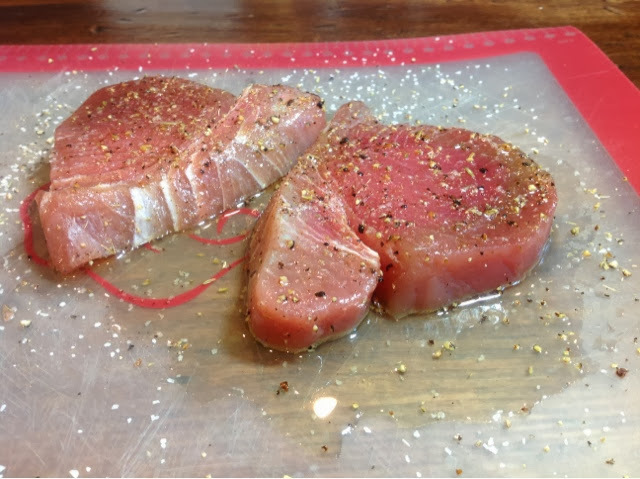 Coat the tuna steaks with canola oil. I used an oil from Costco called Mediterranean Blend that is a combination of canola oil, olive oil and grapeseed oil. It is great for frying and grilling. Preheat the grill or grill pan to high. 2. 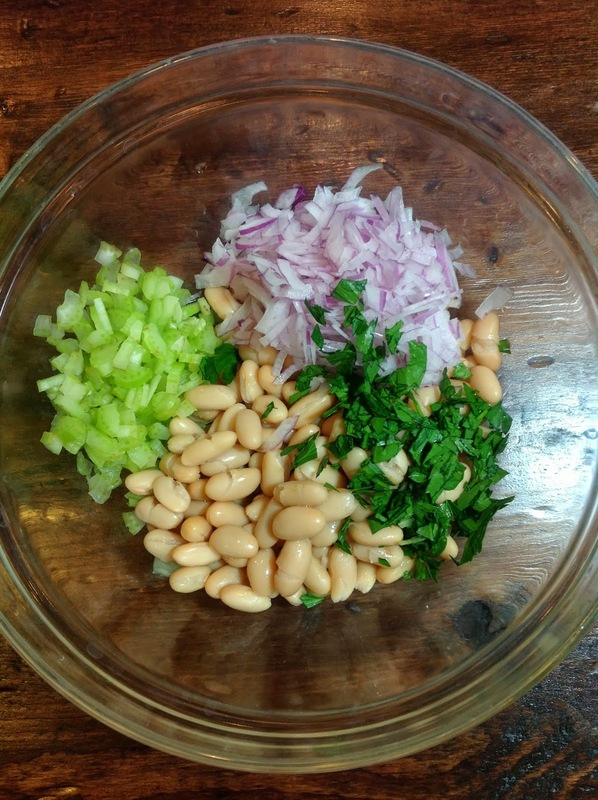 In a medium bowl, combine the beans, celery, onion and parsley. 3. In a small bowl, whisk together the lemon juice, olive oil, salt, pepper, anchovy and garlic and set aside to allow the flavors to mingle for 5 minutes. 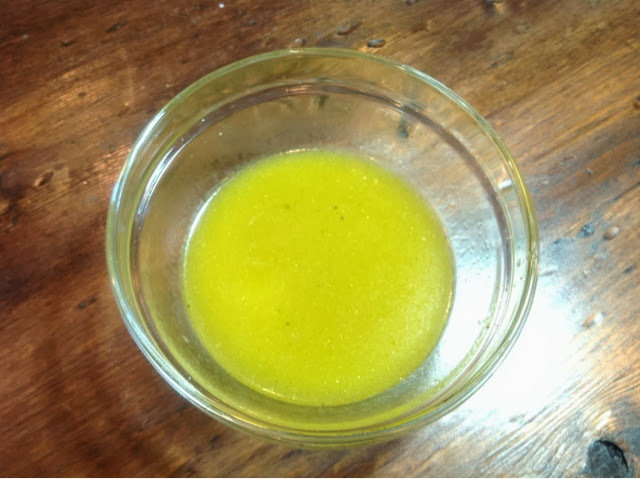 You could omit the anchovy if you prefer but the anchovy adds a wonderful depth to the dressing. Don’t worry, it won’t taste fishy! 4. 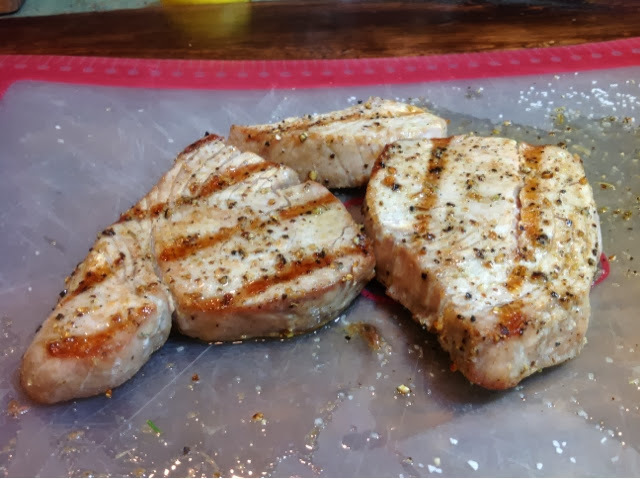 Place the tuna steaks on the hot grill or grill pan and cook for approximately 3 minutes on each side or until the tuna is cooked through but still juicy. Remove the steaks from the grill and allow the tuna to rest for about 2 minutes. After it has rested, flake the tuna with a fork and add to the bowl with the beans. Pour the dressing over this mixture and stir gently to combine. Taste and add additional lemon juice or salt and pepper as needed. 5. Toss arugula with a drizzle of olive oil first, then the juice from 1/2 of a lemon. Sprinkle with a finishing salt, like Maldon Sea Salt and freshly ground black pepper. Mix gently with your hands. 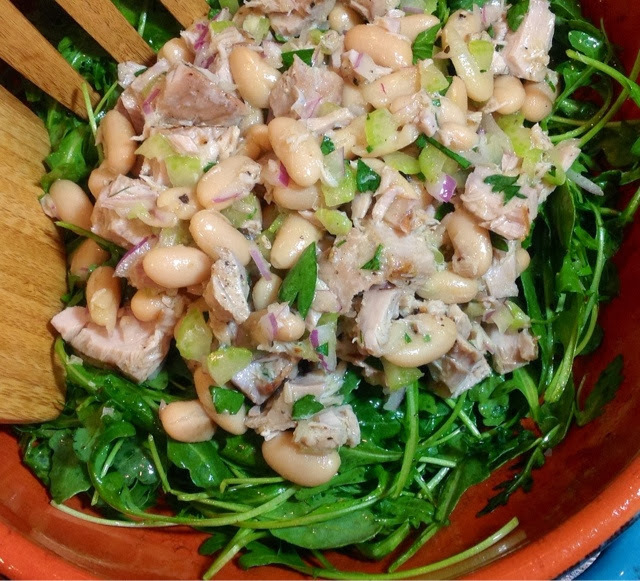 Top each serving of arugula with a mound of the tuna and white bean mixture.